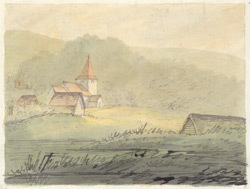 A watercolour and pencil drawing showing the north east view of St John the Baptist Church in Halling in Kent. It was originally a Norman nave and chancel. The chancel was extended in the 13th century. The west tower was also added in the 13th century and was later given angled buttresses and dressed with bricks. It has a short recessed spire. In the north east corner is a ragstone wall , the remains of a Bishop's Palace.